Remember your childhood when you wanted to walk or race on the moon or mars? In fact you still sometime want to go there when you watch movies. But have you ever gone there? But you have a smartphone that will show you the path to the moon, mars or even places that you didn’t think you can go. Yes, I am not kidding. 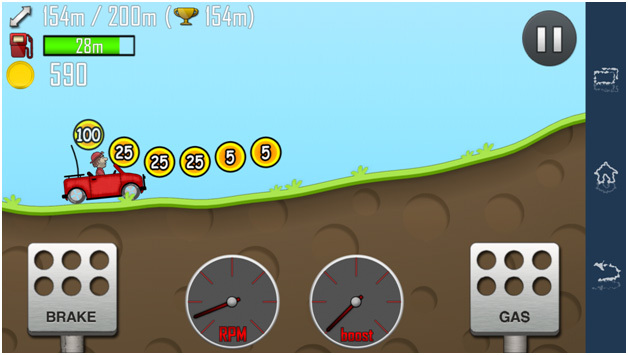 This is “Hill Climb Racing” one of the most downloaded game ever published in Google Play Store. You’ve probably played Asphalt series and NFS series racing but don’t you get bored playing the same type of game again and again? You must be I know. Today I will present a game here which is totally different from other racing games. This is not only a racing game but also thrilling game as well. In asphalt and NFS series you only race on roads that we are used to watching in television. But in this game you will experience something different, something unique, something special, of course something great. What if you raced in alien planet? What if you raced in a volcano? Can you race in roller coaster? Well, you can experience that at least. So, let’s dive into it and find out. Game Play is awesome. You will not find any fault with it. Believe me no bug at all. Like all the racing games there are laps to cover but here in this game you need to continue racing to a certain distance to reach the next level. When you get to the next level you get a bonus.The maps are like zigzags. There is no obstacle on the racing way. You move further and collect bonus. This is infinity a racing game. The more you play the more you get coins but you cannot end the game. The game controls are very easy. There are only two buttons showing on the screen. One is on your left side and that’s the accelerator which is used to speed by holding that button. Another is the brake which is used to slow down. You don’t need to worry about other controls because there are no controls other than these two. This is probably the easiest game control of all the games. Think about other games where you have 4 controls two move left-right-up-down. But here you have only two which is big enough to control a car. With your collected coins you can upgrade your car’s engine, stunts and other things. You can buy levels. You need a lot of coins to unlock all the vehicles and levels. So start playing now. You think you can race till the end of the last drop of your cell charge. No you can’t race that much time and this is the challenge. When you race in a cave you try to stunt or flip over and you end up crashing and the game ends. You lose. There is a trick to score high points within short time and that is to continue racing without crashing. Once you crash you need to start from the beginning and reach the desired level again and thus is the challenges of the game. Now let’s explore the game level. If you want to experience racing with ambulance, tractor, bus, motonieve, camion, big finger, trencito expreso then you must play this game. You can stunt in 5 different ways. You can fly on moon and now your dream comes true. When you have upgraded vehicles you are ready to stunt all the available vehicles. One special thing is you can use any vehicle in any level. The coins you get will unlock the level and vehicles for you. I have played every popular racing game but never found a competitor game like this. This is unique to play, unique to experience, thrilling to race. So you play this and I am sure you are going to say that it’s the best racing game in the mobile platform. SO that’s all for today. Will be back here with another app or game and till then keep playing this game and share your score in YouTube or in Facebook. Let the people see what you can do. Play the best, be the best.